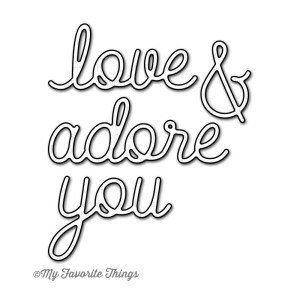 Dainty sentiments in a beautiful, flowy font make the Love & Adore You Die-namics the perfect choice for mixing and matching with a variety of love-themed stamp sets. This versatile set can be used for far more than Valentine’s Day projects – you’ll be reaching for this set year-round! This 4 piece set includes the following elements: love 1 5/8” x ¾”, adore 2” x ¾”, you 1 3/8” x 1”, ampersand ½” x 7/8”. MFT Die-namics dies are My Favorite Things own exclusive American-made line of steel dies. Die-namics dies work with most tabletop die cutting machines, instructions on enclosed card.